"Specializing in all of your travel needs"
Robert Prentice Travel has been serving the community for over forty five years. Corporations as well as, groups and individuals have taken advantage of our personalized service. both quality and memorable experiences in every facet of their travels. 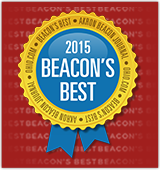 Once again we are listed in Beacon’s Best Magazine as one of the top 3 Travel Agencies in the area! Copyright © 2019 Robert Prentice Travel.